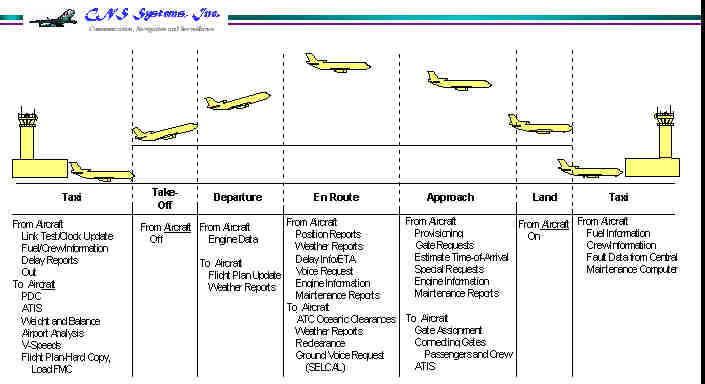 Pilot Information Gathering and Planning: The entire flight plan can be delivered to the Flight Management System (FMS). Dispatch release and load information. Used to determine crew duty cycle times, maintenance intervals, and crew pay. Along with a reactive maintenance program, allows airlines to obtain extended warranties, resulting in major cost savings. ETA report results in effective control of flight operations. Automatic Dependent Surveillance (ADS) automatically generates position reports at predetermined time intervals directly from the navigation system. Enhanced dispatch monitoring of operations ensures system/hub operations integrity. Eventually, ATC will use ADS to enhance air traffic management. Monitoring ATIS voice broadcasts during periods of high cockpit workload is a time-consuming distraction. The aircraft does not need to be in VHF voice range of the airport, and the pilot can view the information at his or her discretion. Weather advisories, Notices to Airmen (NOTAMs) changes, and hazard reports, such as wind shear/microburst alerts. Mode 1 (ACARS) AM/MSK @ 2400 bps CSMA Suffers from low data rate and "hidden transmitter" problems. Supports both voice and data.